Sweet and creamy peach mess, a simple adaptation on the classic dessert. From a recipe in the August 2018 issue of LandScape. 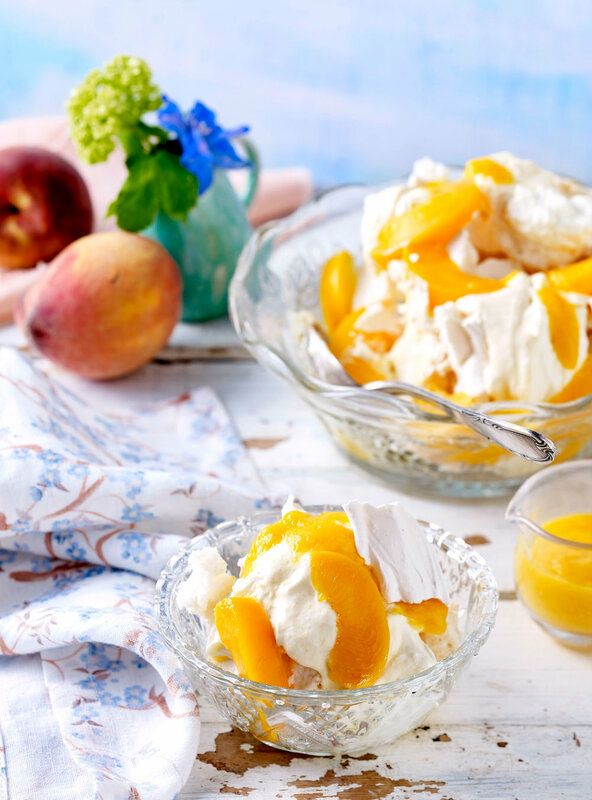 This recipe for fresh, sweet peach mess includes instructions on how to make meringue, but for a quicker, easier treat ready made ones can be used instead. 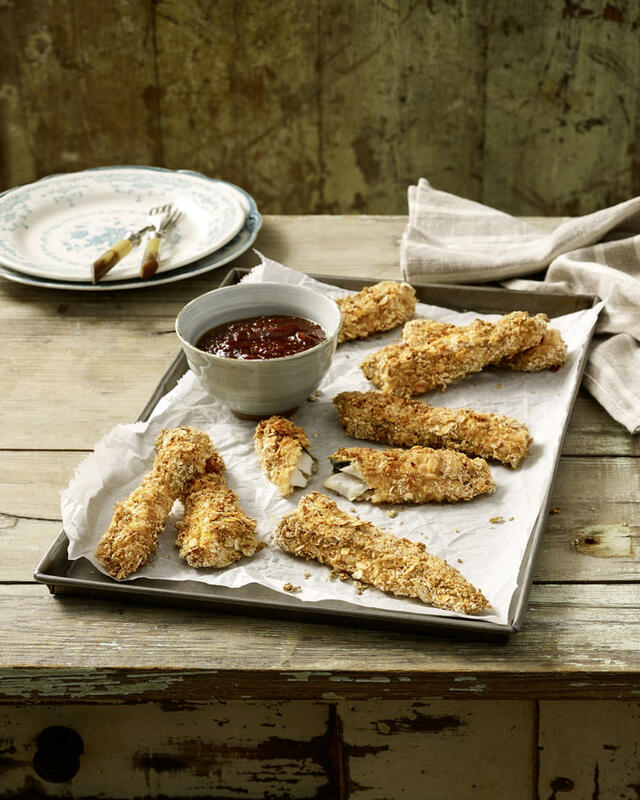 Remove skins for a silkier texture, or leave them on for more bite. Preheat the oven to 100°C/gas mark ½. In a bowl, combine the caster sugar and 150g of the icing sugar. In a separate bowl, whisk the egg whites, using an electric whisk, for 4 mins until thick and fully whipped. Continue to whisk on a low speed and add the mixed sugar a tablespoonful at a time. Whisk on medium for a further 6-8 mins until the mixture is stiff and stands in peaks. Line a baking tin with greaseproof paper, then spread the meringue approximately 2in (5cm) deep on the paper. Bake for 1 hr, then turn off the oven, leaving the meringue inside for at least 4 hrs. Place the chopped peaches in a bowl and blend with the cold water until smooth, using a hand blender. In a separate bowl, whisk the cream for 2-3 mins until just firm, then add the remaining icing sugar. Transfer half of the mix into another bowl. Add half of the peach juice to one of the bowls and stir in thoroughly. Break the meringue into large pieces. In a large serving bowl, roughly mingle the meringue, cream, peach cream, peach slices and peach juice together. 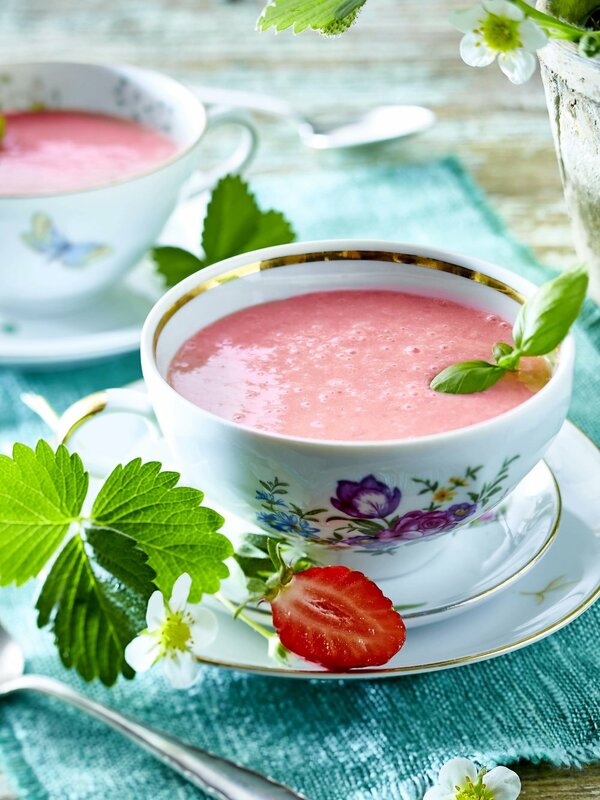 This incredibly simple recipe for a chilled summer soup makes a sweet, refreshing dessert. 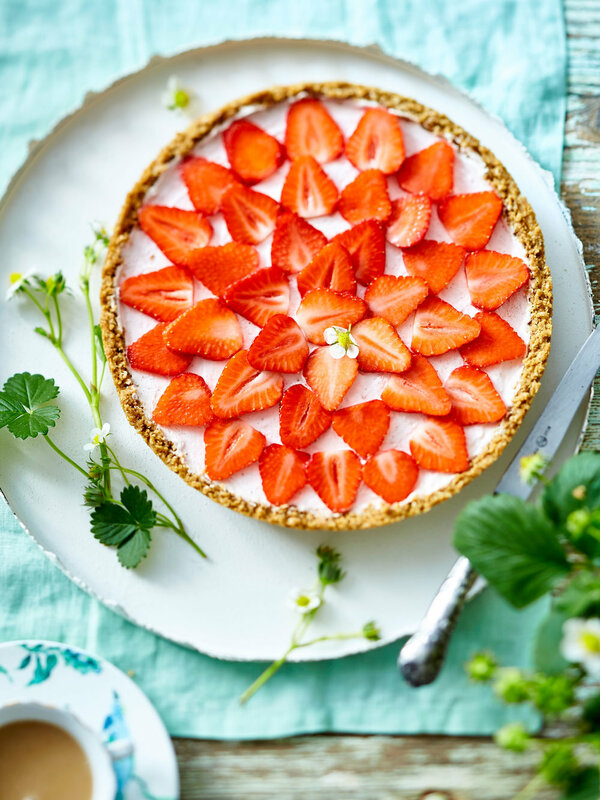 In a food processor, blend the strawberries until very finely pureed. Add the honey, yogurt and wine, and mix well. Leave to chill for 1 hr. Stir the mixture, then divide between six cups and garnish each with a basil leaf.